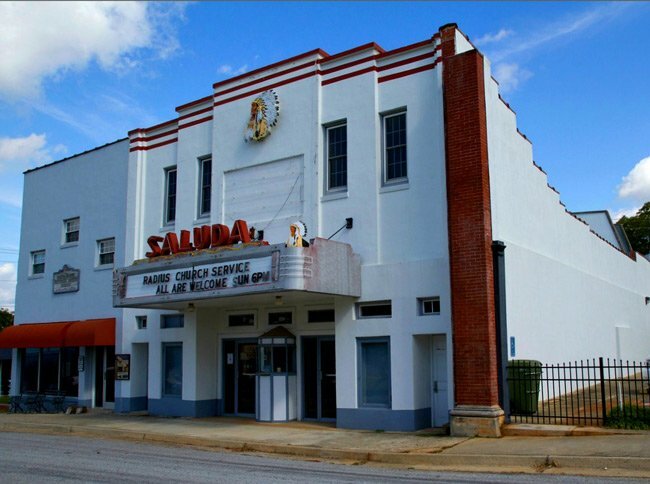 The Saluda Theatre was designed by Charles Thompson in the Art Deco style and opened in 1936. It served as the focal point for entertainment in Saluda and surrounding areas until it closed in October 1981. In 1987, the theater was purchased by the Saluda County Council and donated to the newly chartered Saluda County Historical Society, which fully restored the theater and established the Saluda County Museum in an adjoining building. Today the theater is home to the Saluda Players, the city’s community theater group. Designed by Charles B. Thompson, the Saluda Theatre is a two-story, stuccoed masonry building constructed in 1936 as a cinema. 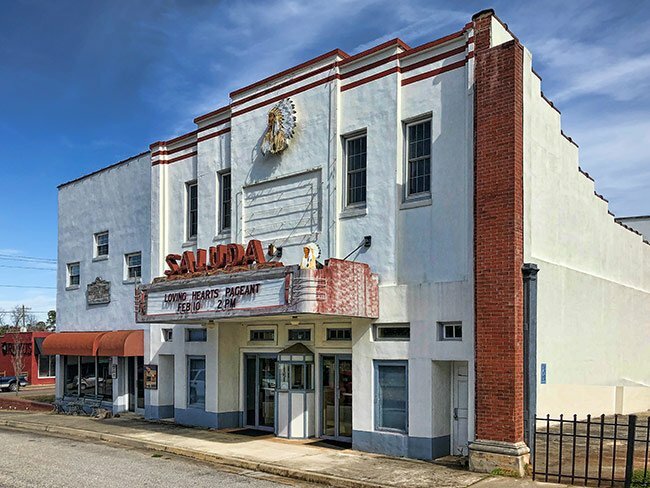 The Saluda is significant as an unusually intact example of a small town theatre in the Art Deco style and for its role as a focal point for entertainment in the community during the 1930s and 1940s. The theatre reflects a period of motion picture theatre construction that swept the country in the 1920s and 1930s. Like most other movie theatres constructed during the second decade of the period, the building was influenced by the Art Deco style. The crisp, simple lines of the façade and the geometric designs of the interior wall finishes and lighting fixtures reveal the influence of the Art Deco style. The theatre is prominently sited in downtown Saluda across the street from the courthouse square. It was open for forty-five years, closing in 1981. What a fantastic bit of information! We think we would have paid that quarter to feel the cool air for awhile ourselves! My paternal grandfather was said to go to this theater back in the 1950s after a long, hot day as a blacksmith. This theater was said to be the only air-conditioned building at the time. “Babe” Langford often slept in the seat up under the balcony, in the chilled air, snoring away, for just one quarter!